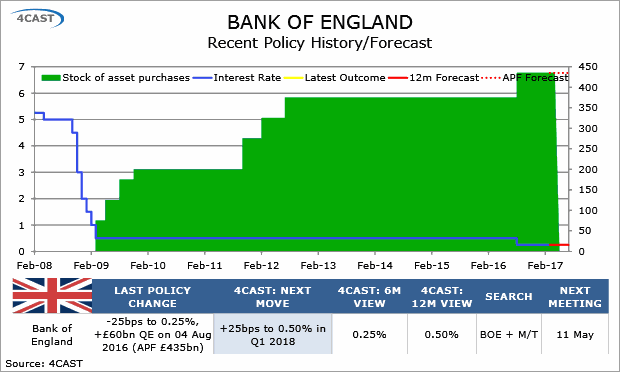 The Bank of England (BoE) left policy unchanged, but Kristin Forbes voted for a Bank Rate increase and others are beginning to subscribe to her views. Implied rates suggest markets are yet to be convinced, as Brexit remains on track and Forbes’ term expires in two meetings. The FOMC has raised rates, as expected, with Chair Janet Yellen and the policy statement both making clear that the Fed’s inflation target has nearly been achieved. The median estimates for the end-2017 and end-2018 funds rates went unchanged. Market reaction suggests this is dovish relative to expectations, while the end-2019 median has edged upward. Bottom line - February inflation rebounded but the BCRP seems comfortable on the fact that inflation expectations are grounded below the upper side of the target band and feels that it could turn its attention to faltering recovery. 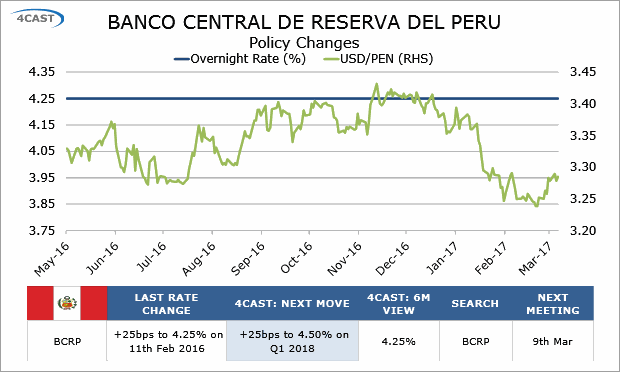 Barring unexpected PEN weakness or supply shocks the BCRP will keep the reference rate unchanged for the rest of the year. Bottom line: Today’s U.S. employment report shows strong hiring, but no real acceleration in wage gains. That leaves the Fed rate outlook much as it was—at least three hikes this year, a March hike assured. Whether the next Fed hike will come in June or September is a close call, but there will be more news on this point next week. Bottom Line - Majority focused on weak growth and consumer confidence, minority focused on resilient inflation expectations and signs the economy is about to rebound. As the board new elements seems to be in the dovish side. 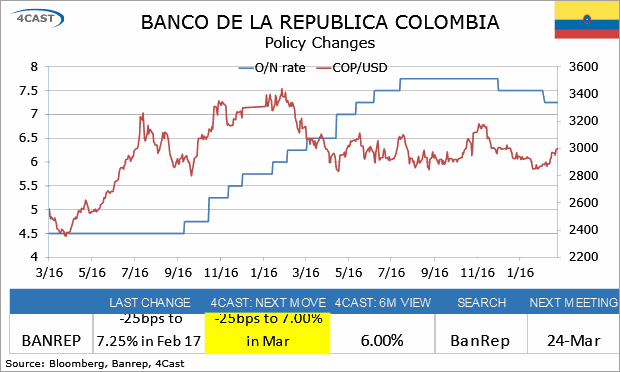 We expect rates to fall again in March.